The latest edition of Research That Matters, "Passion & Promise," explores how the UW College of Education is approaching the biggest challenges in education with a spirit of possibility. The following story about the College's Partnership for Science & Engineering Practices with the Seattle and Renton school districts also appears in the online version of the magazine. As part of an all-day session, 40 elementary school teachers from across the Seattle School District break into smaller groups to share, analyze, and come to a common understanding of their students’ work in science. As the teachers dive into the work, there’s palpable energy in the room. Intense discussion is punctuated by occasional laughter. At one table, the conversation focuses on ways to help kids understand the subtle difference between logical and scientific reasoning. At another table, ideas are shared about how to help kids conceptually distinguish between weight and mass and understand how both affect motion. The teachers have come together several times a year for the past three years for 80 annual hours of professional development, as participants in the state-funded Partnership for Science & Engineering Practices (PSEP) project. PSEP is an ongoing collaboration between the Seattle and Renton school districts, the UW College of Education, UW College of Engineering, and the Institute for Systems Biology. In total, PSEP has worked with 80 elementary school teachers and 70 middle school teachers in Seattle Public Schools, and a parallel group of about 30 teachers from middle and high schools in Renton School District. Each year, the project has focused on different aspects of science and engineering education, to help the teachers prepare their students for challenging Next Generation Science Standards. During today’s session, the focus is on the scientific practices of explanation and argumentation, according to PSEP Project Manager Gilda Wheeler. The teachers have taken what they learned during earlier sessions and applied it in their classrooms, she says. Now, they’ve come back together, working with UW researchers, to talk about their results, refine approaches, and brainstorm better ways to give their kids a deeper understanding of important science and engineering concepts. 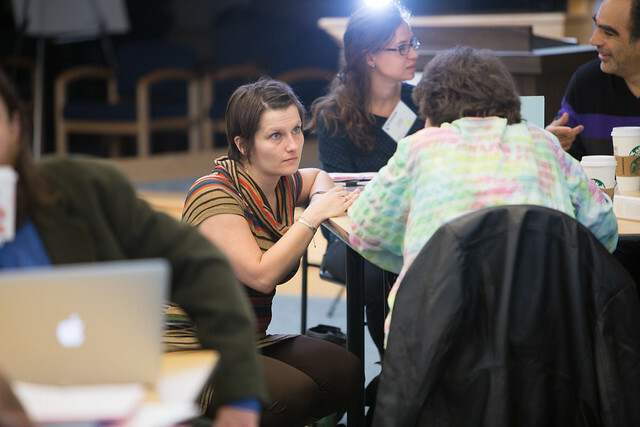 As the teachers work in small groups, UW researchers join in the discussions to contribute to the curriculum design work and to track progress. In order to understand how this kind of implementation model works, the researchers are identifying ways that one group’s struggles or successes can inform other groups and longer-term goals and strategies of the partnership. “This kind of work represents a deep, collaborative research-practice partnership,” said Professor Philip Bell, Shauna C. Larson Chair in Learning Sciences and one of PSEP’s lead researchers. 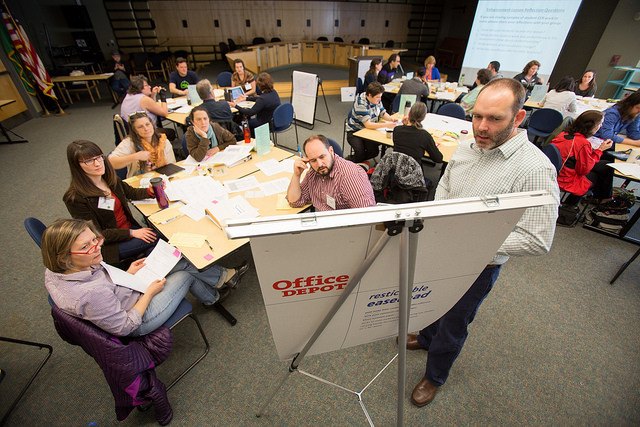 The involvement of UW researchers in this effort is supported by the National Science Foundation through the Research+Practice Collaboratory—which is focused on supporting and studying educational improvement projects through collaborations of educators and researchers. Bell said as the teachers learn new concepts from the researchers, the researchers also learn from the knowledge and approaches teachers have developed in their classrooms—learning that is once again applied back to the research in a complementary give-and-take. To assess the change PSEP has inspired, the College’s researchers, including Bell and Research Assistant Professor Andrew Shouse, have made use of social network analysis. According to Shouse, they’ve discovered that most of the teachers involved in PSEP are actively sharing what they’ve learned—and that’s changing the way science is being taught in the districts. According to Seattle Public Schools Science Program Manager Dan Gallagher, who serves as principal investigator for the partnership, collaboration among teachers is an essential feature of PSEP. Gallagher, who earned his Master in Teaching and is currently working toward his Ed.D. at the UW, explained that developing teachers’ skills and capacities, and empowering them to share those skills with other teachers, is a great strategy to address science standards that are so new that updated curriculum materials aren’t yet available. Gallagher said a significant number of PSEP teachers have returned from sessions to lead professional development trainings for their entire schools—an extremely positive outcome the researchers hadn’t anticipated. The social network analysis reveals that almost 30 percent of participants have done so, helping extend the work further. While the cross-disciplinary scaling was unexpected, implementing a project that would essentially scale itself was always a key goal of PSEP, Bell said. Those new questions to investigate include how to create improvements when working with school districts that are very different in size, philosophy, and structure. “We’re trying to figure out how to get really powerful ideas about teaching and learning more coherently in place across complex districts,” Bell said. Another challenge of PSEP has been dealing with the many issues beyond science instruction faced by the districts—challenges that can profoundly impact the effectiveness of new approaches, Shouse said. The PSEP partners recently learned they’ll have an opportunity to continue that work. Gallagher said the partnership has received funding for a new three-year project. PSEP 2 will have similar goals and methods, but will focus on middle and high school science teachers. It will also look closely at the difficulties faced by culturally and linguistically diverse students as they learn science. It’s a focus inspired by work being done with a focus on science instruction for English Language Learners (ELL) by Kerri Wingert and other College of Education graduate students, Gallagher said. Professors Philip Bell and Andrew Shouse and Seattle Public Schools’ Dan Gallagher discuss the College of Education’s PSEP project in a video for the National Science Foundation’s 2015 Teaching & Learning Video Showcase.